Start with a Question: Effective EdTech Integration Starts with "Why"
Educators know why they teach. EdTech entrepreneurs know why they think their tool will solve a problem for teachers and students. But why is technology integration in the classroom essential to learning for today's students? For over a century, inventors and thinkers have claimed that the latest piece of technology would revolutionize education. How are mobile technology and web-based apps different than every invention that preceded them? The answer is that they are not, really. It isn't the technology that changes education. Technology is a tool that can make a revolution in education possible. But this is only possible if we change our approach to learning. These are the questions I ask myself as I plan learning experiences for my students. It is important to note that the order of these questions is key. Question 1: Why do I want my students to learn X? Note that the first question is not, "What do I want my students to learn?" -- signified by X in the heading above. I know the answer to that already. I have a curriculum. The "Why" question gets to the root of my choice to become a history teacher, or any educator's choice of a topic or level. It forces us to think about why we have a passion for our specialty. My passion is history. For example, recently my students studied the Reconstruction Era of American history. This is the time period just after the Civil War when the nation attempted to heal the wounds that a war had created and rebuild the South. In addition, there were important reforms for African Americans, especially former slaves. Why do I want my student to learn about this era? It isn't merely because it is a part of the curriculum, because it is next in the list of units after the Civil War, or because I am personally fascinated with the incredible changes to our Constitution that were made during that era. I want my students to learn about the Reconstruction because it was a time that held great promise for the cause of equality for all Americans, but failed. I want them to understand what the reforms of the era were supposed to do, but didn't. My hope is that they will learn that great change takes time, perseverance, and that successful reformers do not give up even in the face of incessant resistance. They can carry this lesson forward and become effective change agents for causes they are passionate about. What is reform? Is it a process or an event? How can we ensure reform will succeed? Notice the key terms of this particular time in history are not mentioned in the question. Reconstruction; the 13th, 14th, and 15th Amendments; Freedman's Bureau; Ku Klux Klan; and sharecropping are not even referenced. This is evidence of why I'm passionate about teaching history. It isn't about memorizing terms, dates, or people. We must learn from events of the past so we can be better people and create a better society. Question 2: How do I want my students to experience learning X? If students are going to digest the importance of this lesson and apply it to their own lives, they have to go through a learning process that makes it relevant to them in a real tangible way. Sure, they will learn by reading, practicing, sharing, discussing -- but they need to do all of these things because it is what professionals do. Remember, school is not preparation for real life. School is real life for our children. Let's acknowledge that at engage them in tasks that truly matter. In the case of the Reconstruction lesson, I decided that I wanted students to become experts on at least one aspect of the Reconstruction. Then I wanted them to be able to provide their classmates with an experience that made them feel a twinge of the injustice felt by freedmen (former slaves) at that time. I would never presume that my high schoolers could truly empathize with the suffering of freedmen in the 1860s and 1870s American South, but they do have a keen sense of fairness and would understand the importance of the cause. Question 3: Can technology deepen learning or make the process more efficient for this particular lesson? For some students, the answer to this third question was affirmative and for others it was not. For example, one group that did a deep dive to learn about the system of sharecropping set up a simulation. Their classmates were moved to small areas of the classroom in little "families". They were given buttons that symbolized seeds, farm equipment, and crops. Then a person representing the land owner came around and collected a share of the crops that amounted to nearly everything, leaving the families with little to feed themselves and start up planting again the next season. At the end of the simulation, families could trade in buttons for candy and there were fewer candies than family members. That twinge of injustice was felt, but no EdTech was used. One of the primary source images used in this example. Another group had the topic of voting rights for freedmen. They put digital copies of drawings from Harper's Weekly in an online folder. Then they created a QR code for their classmates to scan so they could access the folder full of images on their devices. Students were assigned one of the images and told to put it into Skitch, an image annotation tool. 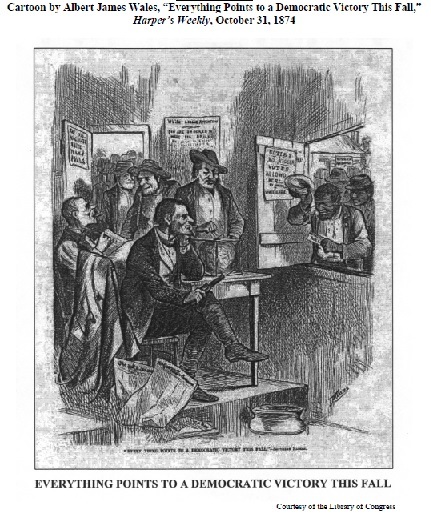 They were instructed to point out the freedmen and the white Americans in the images and add text explaining what the image taught them about the reality of voting for African Americans at this time. Finally, the annotated images were projected on a large screen at the front of the room and discussed by the class. This activity would not have been possible without the technology because digital annotation can be more detailed and in higher definition than on paper. Also, the resulting analysis could not be enlarged to a size that the whole class can see if it were done on paper. Finally, students could save those digital images in paperless notebooks, which are less likely to be destroyed or lost than a single sheet in a paper notebook. In the first example, technology wasn't necessary for students to experience the learning in a way that felt meaningful. In the second, the students' learning experience was fundamentally different because of the effective integration of technology. These three questions should be our test when considering the integration of technology in the classroom. This is how I have operated my classroom for years, and it is how I start the conversation with teachers who are looking for guidance on how to best integrate tech in their classes. Recently I presented this method at a conference. An administrator from a nearby district came up to me at the end of the session and asked if I'd seen Simon Sinek's TED Talk about the Golden Circle. I hadn't, but he said I was living that message. Since then I have watched the video of that TED Talk many times. It is worth the 18 minutes if you are a teacher, administrator, technology integrator, or EdTech entrepreneur. We should always start with "Why"